MANILA, Philippines — In an unusual move, allies of President Rodrigo Duterte in the Senate on Friday condemned the killing of a 17-year-old senior high school student in Caloocan City, with some pushing for a probe into the boy’s death and those of scores of suspects in the past bloody week described as the deadliest since the start of the government’s drug war in July last year. This is one of the rare instances during which senators who belong to the majority caucus in the Senate have publicly spoken against the killings related to Duterte’s brutal and unrelenting war on drugs. The policemen who shot to death Kian Loyd Delos Santos on Wednesday night were not only abusive but also “killers and criminals,” according to Sen. Francis Escudero. “The CCTV footage and eyewitness account clearly show that the boy was killed,” Escudero said in a statement. He said that he hoped that Duterte and Ronald Dela Rosa, the chief of the Philippine National Police, would look into the death of Delos Santos whose mother has just flown in from abroad to face the ghastly specter of her lifeless son in a coffin. The investigation was needed because “the poor boy was not even an addict much less a pusher,” Escudero said. The three policemen who killed Delos Santos have already been relieved, police said. This bloody week started on Tuesday when simultaneous police operations in Bulacan, a province north of Manila, resulted in the death of 32 people suspected of involvement in illegal drugs. The cops added that they also seized P500,000 worth of methamphetamine or shabu and 21 firearms. Then, another round of police operations killed 25 people, this time in Manila. Police officers said the suspects offered violent resistance to authorities, a refrain commonly heard among Filipino cops when asked about the reasons for drug suspects’ deaths. The death of Delos Santos, however, has struck an angry chord among many senators. Delos Santos, according to police accounts, ran away and shot it out with officers from Police Community Precinct 7 along Block 7 Riverside in Barangay Baesa at around 8:45 in the evening. Local media report that a footage shows the boy being dragged by policemen to the place where he was killed. Witnesses also narrate that Delos Santos was blindfolded and beaten when he was arrested. He was then given a gun, instructed to use it and run away, presumably to corroborate a possible police refrain that the suspect violently resisted and tried to escape. Sens. 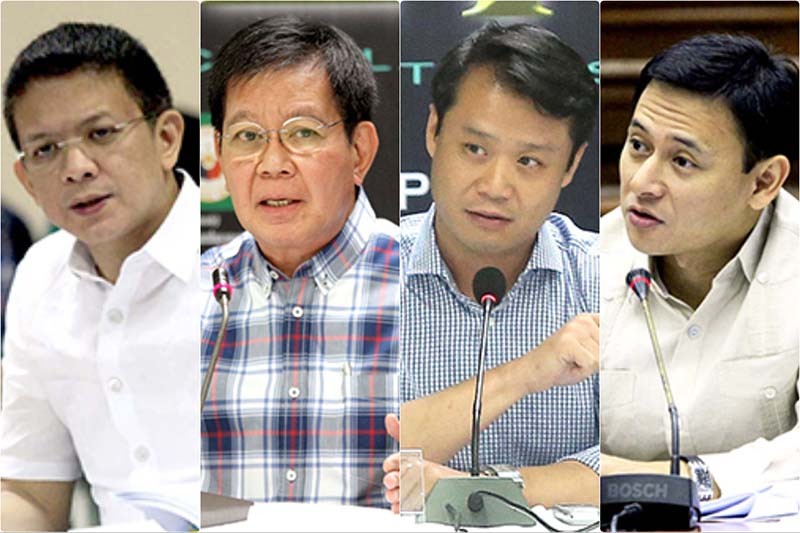 Juan Edgardo Angara, Panfilo Lacson and Sherwin Gatchalian all said that the Senate should conduct a probe into the recent round of killings. Angara said that the country should ensure that it was not creating “killing machines.” Rather, what is needed is “justice machines,” he said. He decried “vigilante justice,” saying it is not a systemic and long-term solution to the country’s drug problems. He also blasted the government’s focus on “demand reduction” while ignoring accusations that Customs officials were remiss in their duty to prevent illegal drugs entry into the country. He said that the Senate should investigate the deaths if the probes by government agencies showed that they were trying to cover up police liability. He reminded the police and the justice department to conduct a “very fair and objective probe” to save whatever credibility they have left since the reinstatement of Superintendent Marvin Marcos and his policemen whose operations led to the death of former Albuera, Leyte Mayor Rolando Espinosa. “It’s worrisome, to say the least, coming even from somebody who in his previous lifetime as a law enforcer was a natural suspect in violating human rights of crime suspects that we used to pursue,” he said. The police would think that they could get away with anything if they would not be held accountable for their illegal actions, according to Gatchalian. “Ang mga pulis, when they can that they can get away of violating the law, lalaki ulo nila,” he said in a separate statement.